Preheat oven to 500 degrees. Trim off the chain, silverskin and excess fat. Using butcher string, tie the tenderloin in 11/2 inch to 2 inch intervals to keep its shape intact. Line a large baking pan with aluminum foil. Coat beef with Mushroom & Sage Olive Oil and place in pan. In a small bowl, combine mustard, Fig Balsamic Vinegar and salt, and mix thoroughly. Using a small brush, coat the meat with the mixture. Sprinkle pepper liberally over the meat. Place in the oven and roast for 25 to 28 minutes for medium rare. For accuracy, use a meat thermometer and roast until it registers 125 degrees for a medium-rare result. Remove from oven and cover with aluminum foil. Let it rest in the pan for about 10 to 15 minutes before slicing. 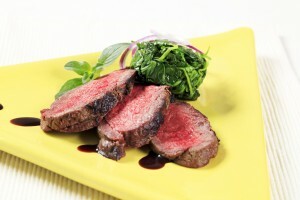 Place sliced tenderloin on a serving platter and serve!